The owners purchased a dated colonial in a great location on the lake and wanted to update it to serve a large, modern day, active family. The goal was also to be in keeping with the neighborhood and "New England Lake House" style. 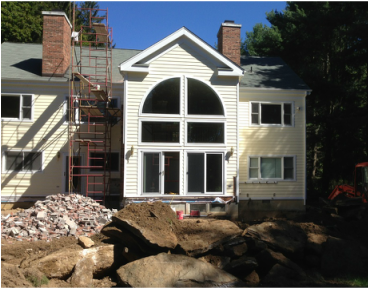 The building was stripped down to the framing and an addition placed at the rear to expand the kitchen and living room. 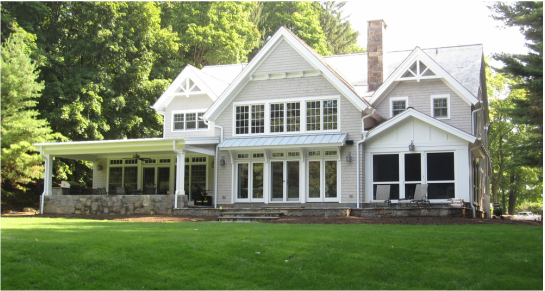 Extensive stone work, custom milled & finished flooring, mahogany details at the front entry, as well as a renovated boat house completed the transformation.